Item # 162197 Stash Points: 10,499 (?) This is the number of points you get in The Zumiez Stash for purchasing this item. Stash points are redeemable for exclusive rewards only available to Zumiez Stash members. To redeem your points check out the rewards catalog on thestash.zumiez.com. Get a watch you can wear every day, with the premium durability of the G-Shock GA700 Black & Red Watch. This watch offers shock resistance as well as water resistance down to 200m for unmatched levels of durability. All kinds of bells and whistles are also added such as a fully automatic calendar, LED backlight, timer and world clock. Step up your daily looks with the G-Shock GA700 Black & Red Watch. 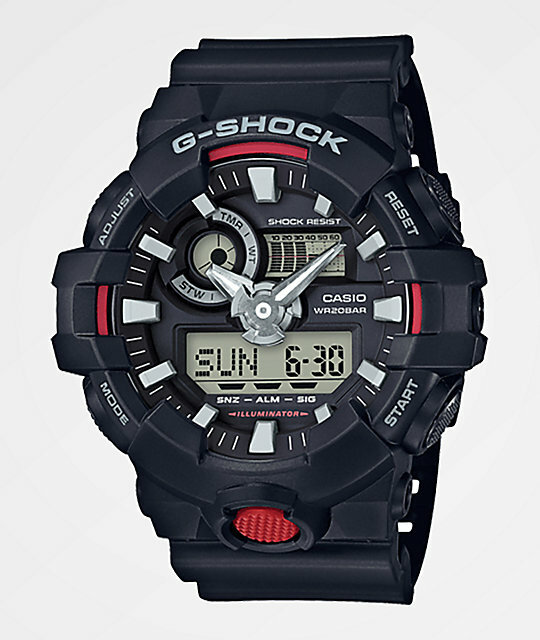 GA700 Black & Red Digital Watch from G-Shock. 1/10th second stopwatch with speed Indicator.